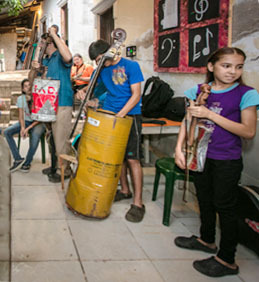 Ten members of the globally renowned Recycled Orchestra of Cateura, Paraguay will come to Bainbridge to meet with area students on May 31 and give a free concert Wednesday, June 1, 2:00 at Bainbridge Performing Arts. 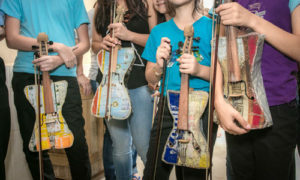 These ten students, representatives of a Paraguayan youth orchestra of about 100 musicians who live next to a giant landfill, will be playing music from instruments made entirely out of garbage. The vision of Favio Chavez, music director of the Recycled Orchestra of Cateura, is to provide access to hope and a better life for his pupils. Now internationally famous, the orchestra’s music is the portal to a life beyond the intergenerational cycle of extreme poverty. 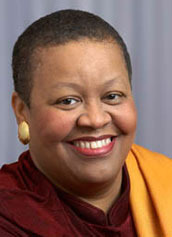 Listen here as Reed Price interviews Dr. Gloria Burgess, the founder of Lift Every Voice Foundation, who has been instrumental in bringing these young people and their director to Bainbridge Island, where they will meet with music students at area schools and members of the Bainbridge Symphony Orchestra. In addition to their free concert on Wednesday, June 1 at 2 pm at BPA, there will be a 7 p.m. showing of “Landfill Harmonic,” the documentary about their journey, at Bainbridge Cinemas at the Pavilion. Following that showing the musicians will be on hand to answer questions. The visit to Bainbridge Island is organized by the Charter for Compassion and is sponsored by Bainbridge Performing Arts (BPA), BI/NK Interfaith Council, Eagle Harbor Congregational UCC, Jennifer Saez and Susan Lorenz of BainbridgeIslandLife.com, Perry Foundation, Town and Country Markets and Winslow Cohousing. Credits: BCB host Reed Price: publisher: Diane Walker.